I love them both in our home. 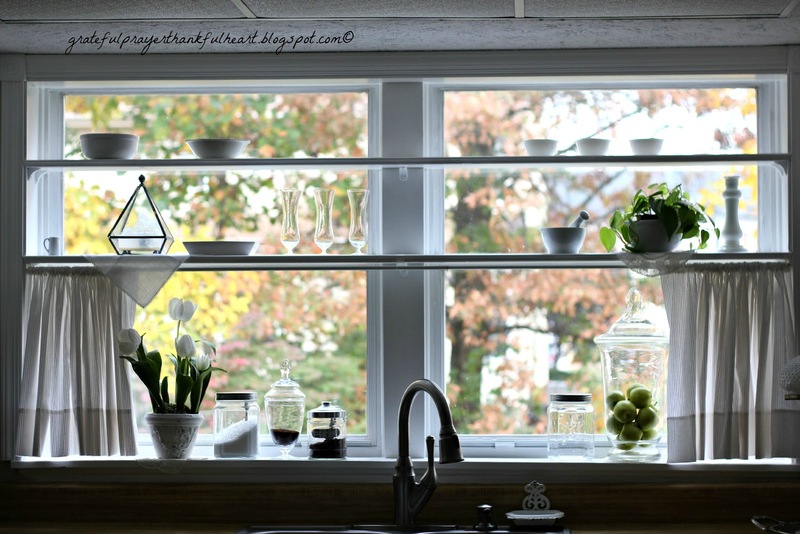 Many times I thought of adding shelves to the kitchen windows. So, part of our anniversary day together was spent picking up supplies for this project. Yup, that’s what you do when married 37 years ~ enjoy being together even in the mundane things. 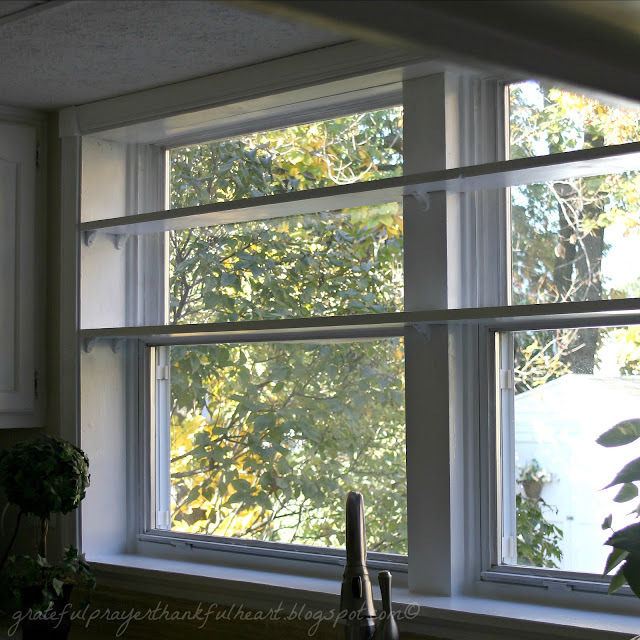 My goal was to update and add interest to the window, include some privacy, still enjoy the backyard view and spend as little as possible. Initially I wanted glass shelves but we decided to make them of wood. We couldn’t find white brackets that we wanted so I painted the ones we liked the style of. Standard molding framed the outside of the windows. Then it was on to spackle the nail holes, sand, prime and paint. John added a thin piece of wood to the shelf edges for more detail. No curtain was Jared’s preference, and I liked the look too. 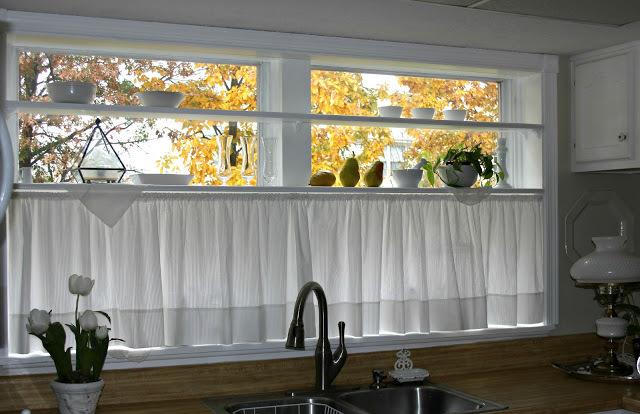 I went ahead and made cafe curtains and hung them with those cute little ring clips from a thin rod. However, I didn’t like gap between the shelf edge and the top of the curtains. So, I simply slid the rod through a single pocket I made. 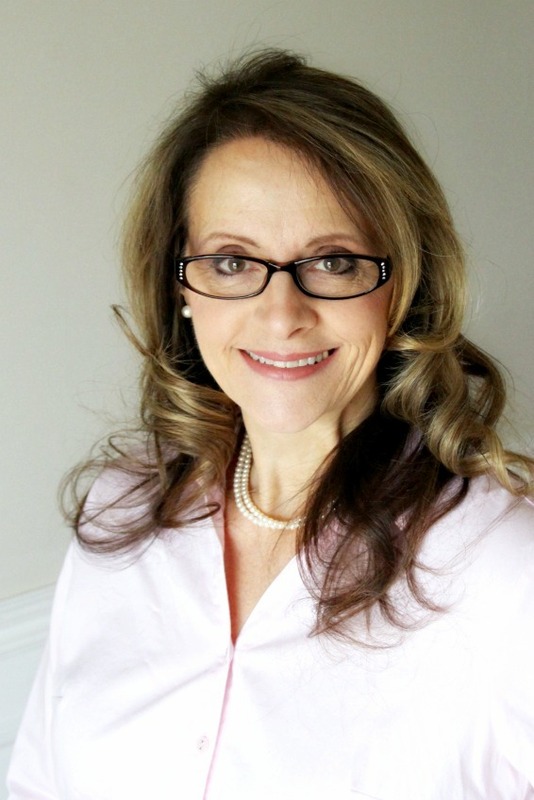 Just found your beautiful blog, now following. Come visit me sometime! Your shelves look terrific; you and your husband did a great job on those. I've long been a fan of cafe curtains, and yours are so cute and cheerful. I think it's good to have some privacy at night. Visiting from Seasonal Sundays; have a wonderful week! I just found your blog and had to post to say I love it. 🙂 And I love the white and light in your kitchen. Just lovely! I love the way your window shelves and curtain turned out. I've thought of doing the same with my kitchen window! You're always an inspiration. Your window looks lovely, It is our 37th in February and yes this is the sort of things we do too! I love the light, love the white, love the newness and oh so welcoming. You and John did a great job. I love what you did! White and light…the best! Thanks for sharing your wonderful idea and photos. really, really nice! I love the cafe curtains you whipped up! That way you can have it with or without! It frames the view very nicely. You two did a great job. Thank you for guest posting for my daughter Kati yesterday. I will be trying this recipe. And I keep forgetting to tell you that I made your peach chutney and served it with grilled pork when we had guests for dinner…and it was a huge hit with everyone, young and old(er)! Your window looks really pretty Lorraine! 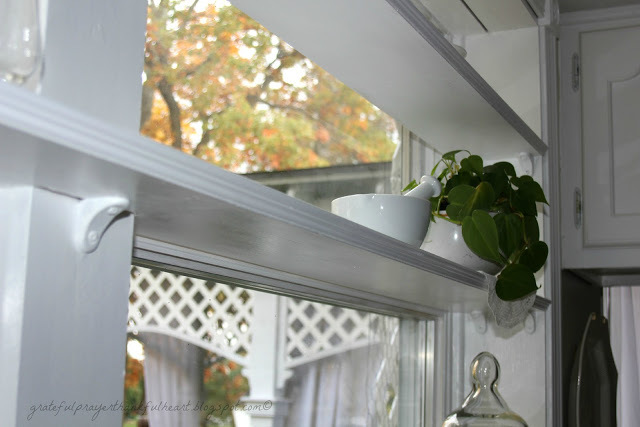 I love the new shelves and I agree…. "no curtains" is the prettiest. So nice that you can pull them to the sides and enjoy both options! The little extra bit of trim is the perfect touch. I love the new look! It was joint effort and you both did a wonderful job! What a great idea you had. It looks really nice. Your photography is amazing, even in low light its amazing. 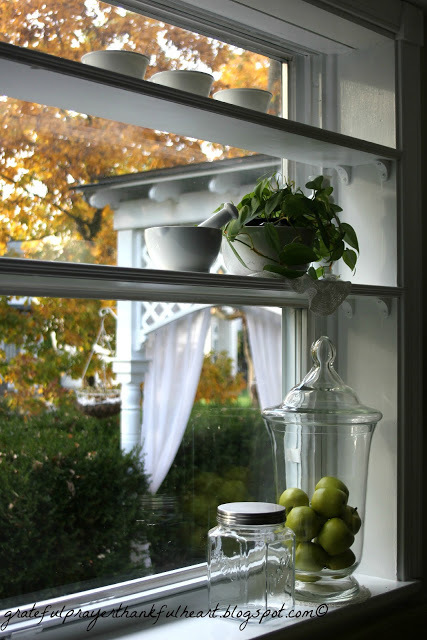 I love your windows and the added shelves can be decorated for all seasons. Light can dance off the glass items. I was going to ask before I read, I was wondering if John routed the edge of the wood but you stated he added trim. Looks wonderful! 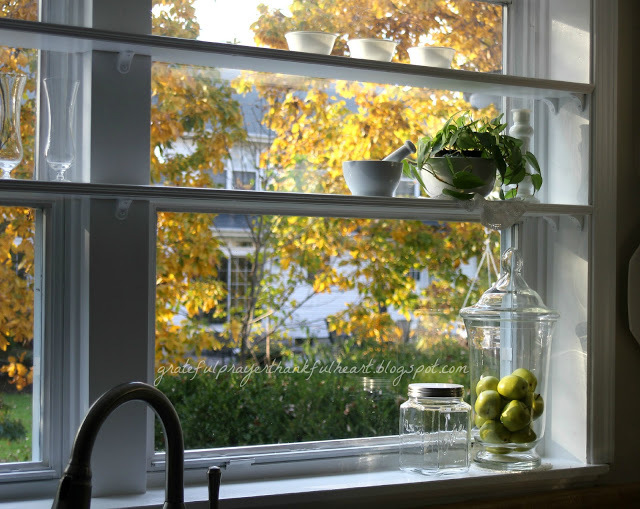 What an excellent idea for the kitchen window! It add so much depth, and I love the white, and the cafe curtain provides privacy at night. Just beautiful! for the beauty you now enjoy! I smiled as I read what you said about, "that is what you do when you are married 37 years". So true. You two sure do make a good team, and you Lorraine could write and illustrate a diy decorating magazine. I for one would buy it. What a good looking window arrangement. Just lovely, Lorraine. I love the shelves and curtains. And, Happy Anniversary to you and your husband! This is a such a beautiful idea! I love how light and bright your home is, too. Ours is the complete opposite, due partly to the fact we live in such a wooded area. The shelves look great! Your windows are so pretty. And with all the green and yellow in the background, they look really charming. So lovely! What a blessing. It's lovely. Funny, but the view from a kitchen window is often the best on a house and yours is lovely – onside and out. 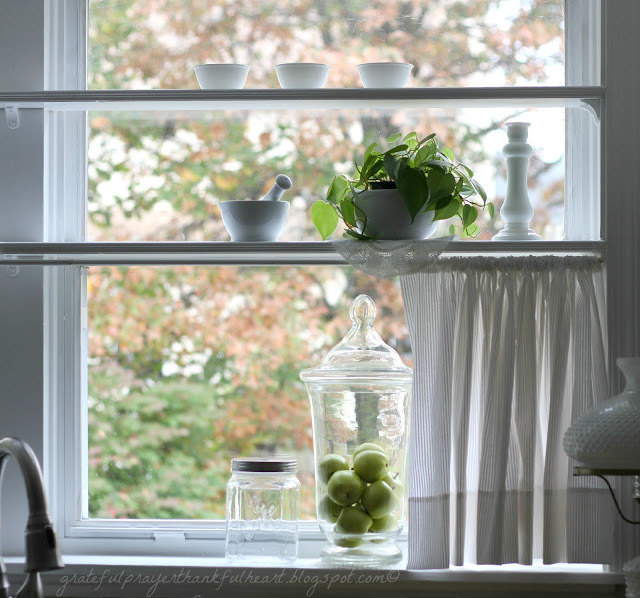 I would like to share your window makeover on my inspiration post next week if this is ok with you. It seems strange to me to see autumn colours when are trees are bursting with fresh green growth here in New Zealand and pretty blossoms are everywhere.